CRAZY DISCOUNT! Was: $129.95 Now: $59.97! 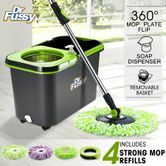 Take the chore out of cleaning floors with the DR FUSSY Spin Mop Bucket System - Microfiber Mop with Easy Wringer Bucket! 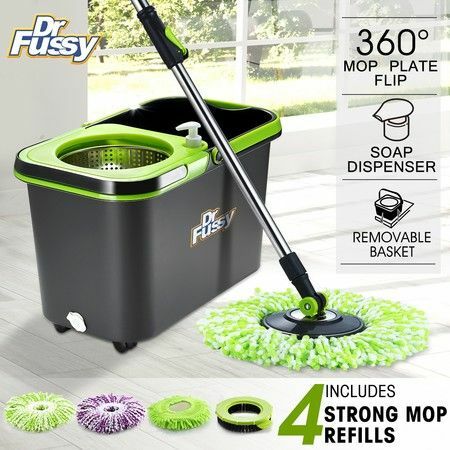 This easy-to-use mop and bucket combination takes the toil out of mopping with and adjustable length handle to suit the users height and high quality wheels that help it easily glide across the floor. The built-in cleaning solution dispenser and drain hole means that bending over to constantly wring and change water is reduced to a minimum. The swivel head combined with microfiber mop heads ensure every spec of dirt is lifted with effortlessly. Great for tiles, wood and bathrooms, the spin bucket system cleans homes in one fell swoop. 49cm x 28cm x 32cm approx. 50cm x 29cm x 33cm approx. Very good mop and bucket. Extremely happy. Great CrazySales very happy with my mop. Good quality.